Make an unforgettable grand entrance wearing this glamorous matching CZ necklace and earrings set by Mariell. Our glamorous silver rhodium wedding necklace set features brilliant pear-shaped Cubic Zirconia teardrops gracefully cascading from sleek pave tops. The adjustable necklace measures 16" to 18" with a 1 3/4" h pendant motif. The elegant dangle drop earrings measure 1" h. This bridal jewelry neck set is also a stunning choice for prom, bridesmaids, mother of the bride, homecoming or any special occasion. We love the hint of vintage styling mixed with sleek contemporary lines. Crafted using the finest quality AAAAA Zirconium and Genuine Platinum plating, this top-selling Zirconium neck set will have heads-turning as you light up the room. 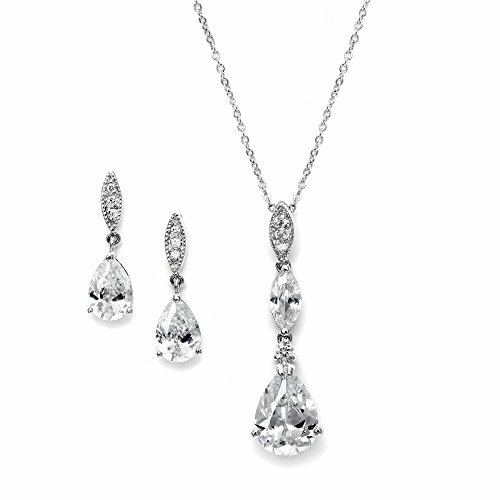 We promise you'll adore this top selling CZ necklace and matching earrings or your Money-Back. Treat yourself or someone you love to some seriously gorgeous sparkle with the look of fine jewelry at a fabulous low price. As always, enjoy Mariell's exclusive 100% Risk-Free Purchase and Lifetime Guarantee.